Karma Bread is a lovely little local bakery up in the village of Hampstead ran by Tami and her team. 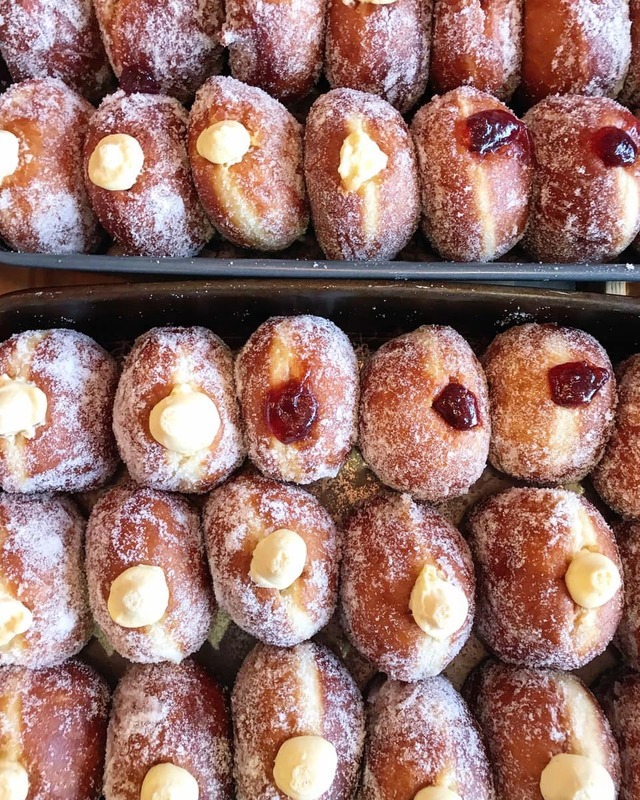 Amongst the freshly baked loaves, sticky cinnamon buns and the most beautiful handmade challah loaves you’ll ever see you’ll find these doughnuts. Filled until they’re bursting with banana cream, raspberry jam or my particular favourite one tastes like apple pie. It’s the perfect place on a Sunday morning before a walk through Hampstead Heath. 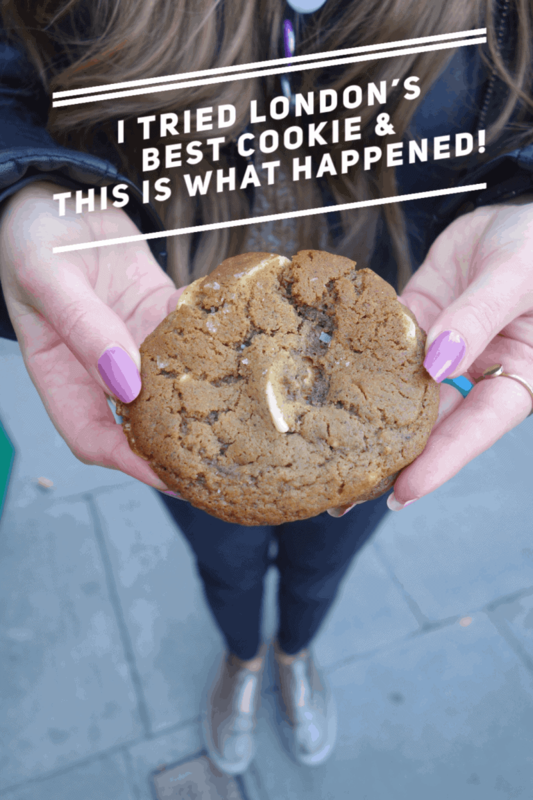 Don’t forget to check out my London doughnut bucket list here. 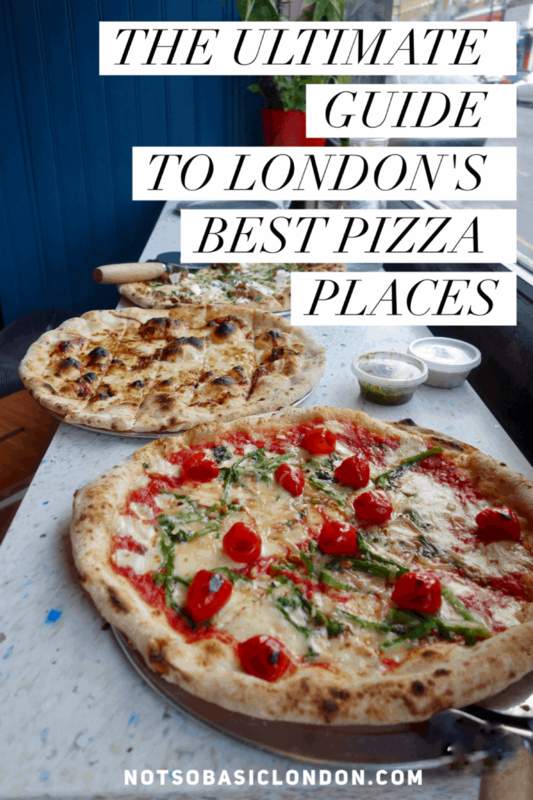 There’s a lot of choice for pizza in London and Quartieri is a new kid in town that should be on your list. If you like truffle (and who doesn’t?) then the tartufata pizza will be the one you’ll go for. 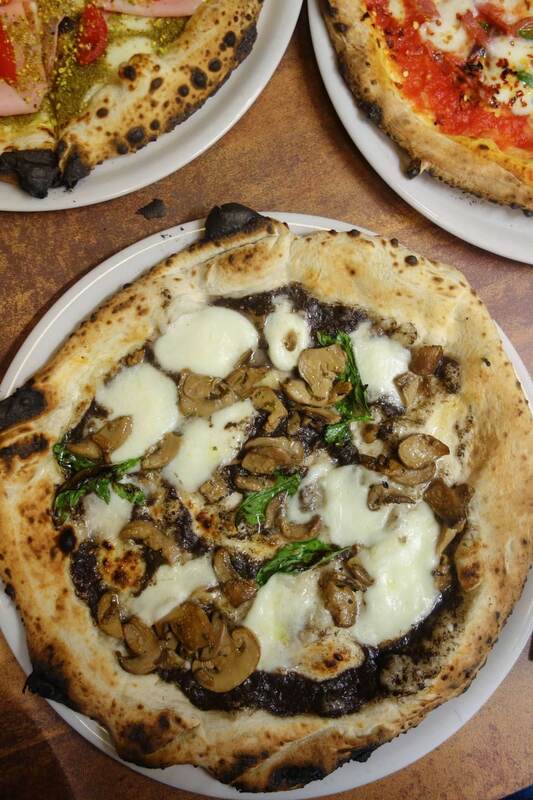 It’s got a white cream base, black truffle salsa, roasted mushrooms and a drizzle of white truffle oil. Truffle can easily be too much or not enough but they have it spot on. As for their other pizzas, the menu is pretty adventurous and not your usual suspects. 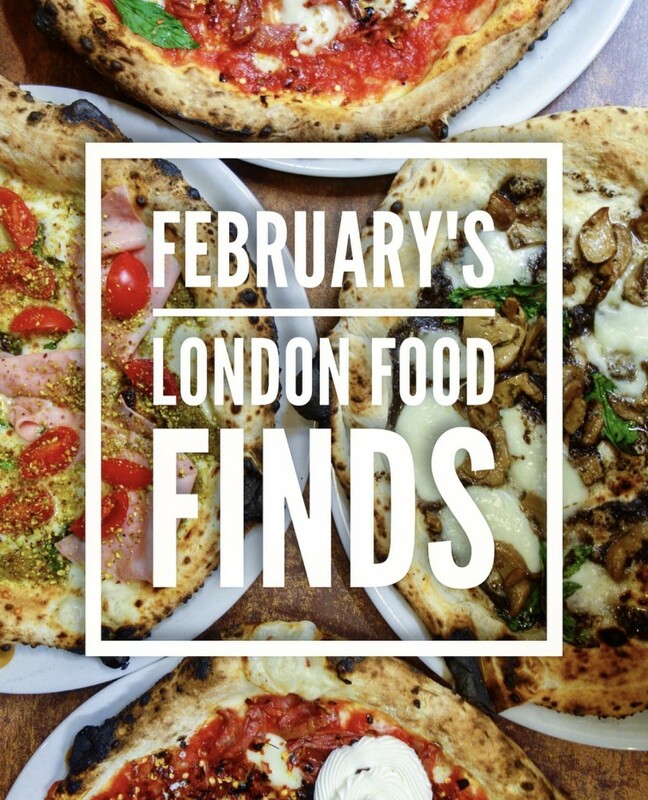 You can eat in or takeaway at this neighbourhood pizzeria. Get the meatballs to start! 3. Hot ‘tapas’ plates, Patron. 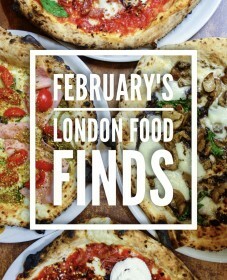 Patron has been mentioned a few times on the blog and most recently on my London Date Night Restaurant Guide. Alongside their beautiful French restaurant that does brunch, lunch, and dinner, they also have a cosy wine cave a few doors down. They offer cheese boards, plates of charcuterie and have now have added a load of hot tapas-style dishes to the menu. 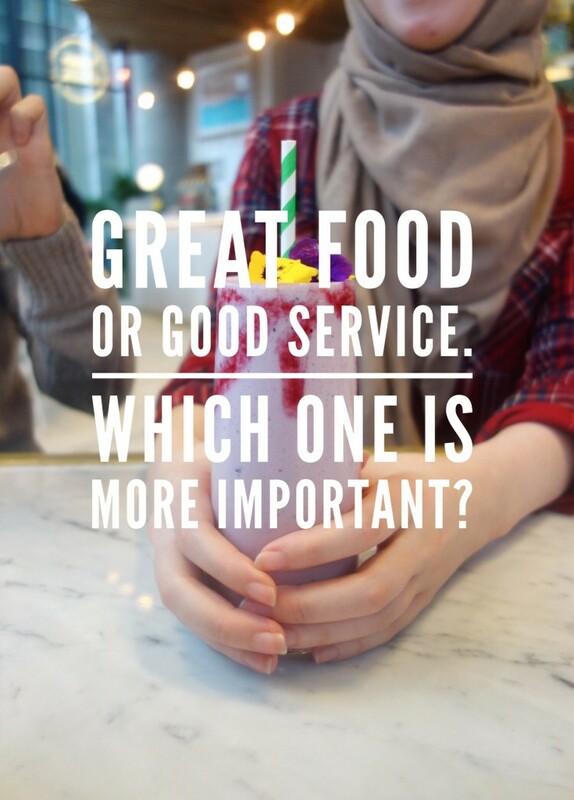 That includes bubbling cheesy potatoes, warm bacon wrapped dates and an unusual savoury French onion creme brulee that you can watch being caramelised in front of you. Add a glass of wine to that and you’ll have arrived in France without leaving North London. 4. Kinako French Toast with Matcha Soft Serve, Shakfuyu. 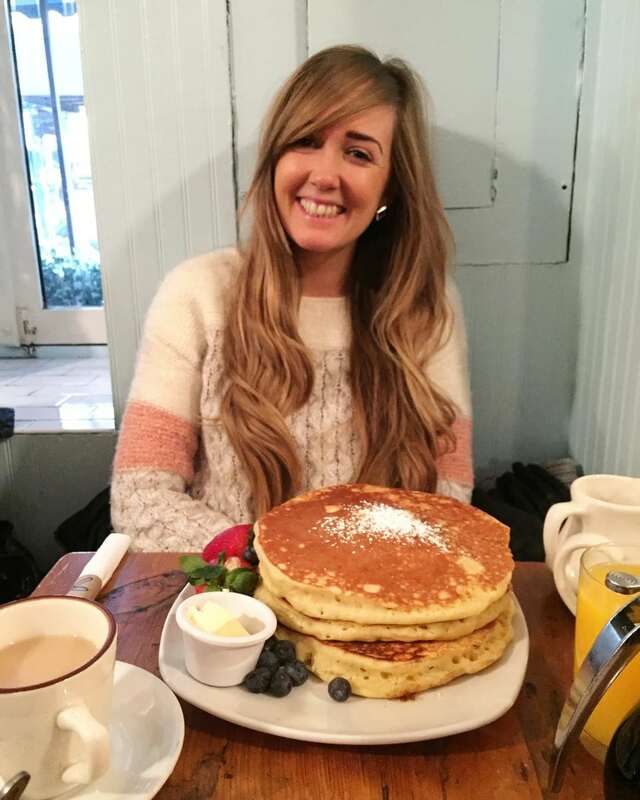 The kinako French toast is a bit of an institution in London. Sooooo many people have asked me if I’ve tried it and I can’t believe it’s only now I have. 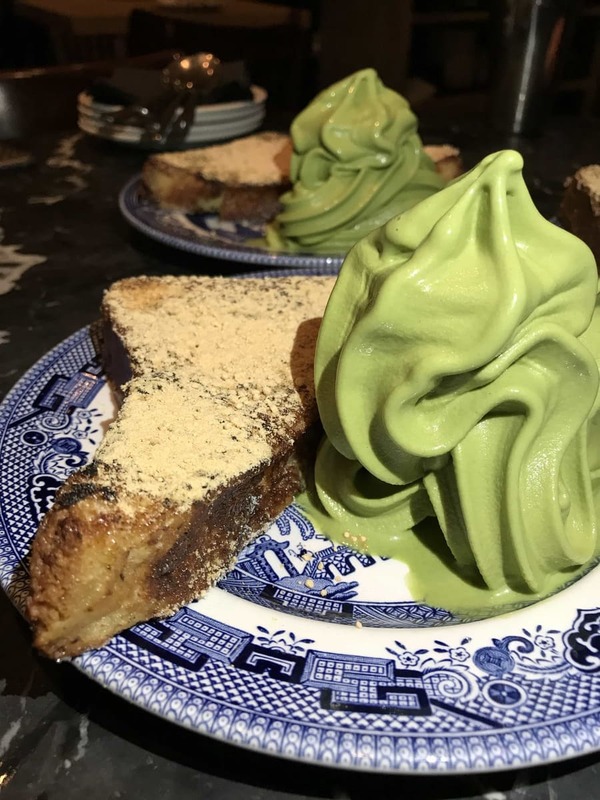 The dessert at Shakfuyu consists of a doorstop thick slice of bread with a caramelised kinako coated outside, has a sweet, gooey, pudding-like centre and is served with bright green creamy matcha soft serve. Even if you’re not eating dinner at Shakfuyu lots of people just go in for this. Me included. 5. Danish brunch plates, Snaps and Rye. 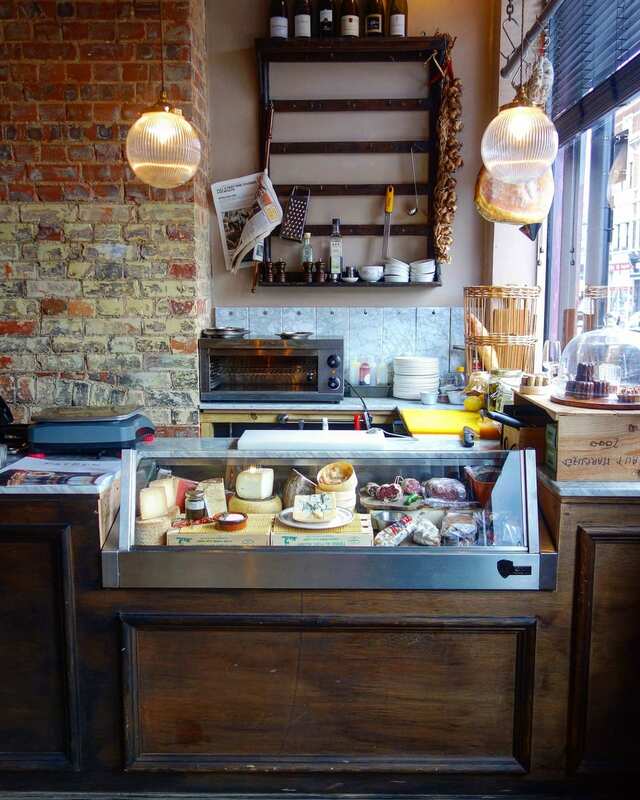 Created in 2014 by husband and wife team Kell and Jacqueline, Snaps & Rye is a Danish cafe and restaurant in West London that specialises in Nordic cuisine and Danish delicacies. In true ‘Scandi’ style, Snaps & Rye is full of clean lines, muted colours and simple, beautiful, ‘hygge’ corners. Named on Time Out’s 100 best restaurants in London, their Scandinavian re-imagining of British classics turns your usual full English breakfast and boring eggs into a ‘full Danish’ breakfast or creamy scramble served with smoked salmon, continental cheese and their creation of the rye rarebit. One of the best takes on cheese on toast you will find made with beer and cheese. Very different, very unusual. Very good! Full blog post here from The London Food Social. 6. Aubergine Shawarma, The Good Egg. 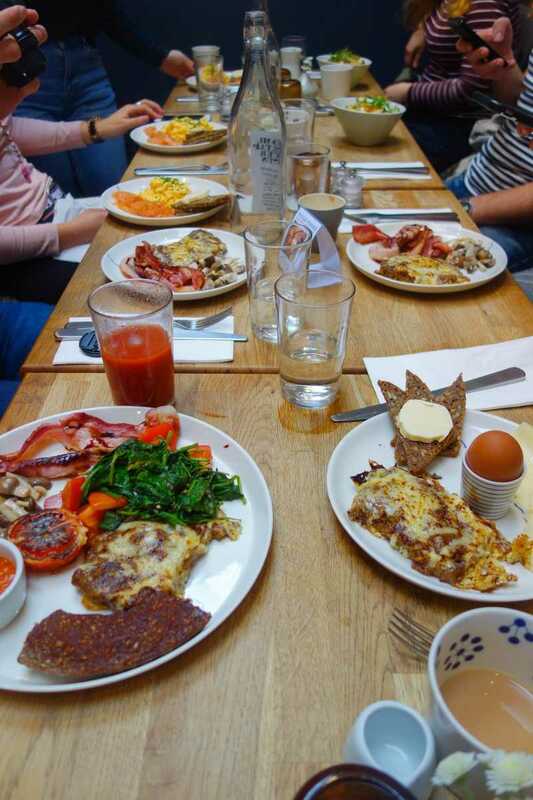 The Good Egg started its life in Stoke Newington and made a name for itself doing Jewish/ Israeli food influenced be New York. Interesting, eh? Being so popular they have recently opened a site more centrally in Kingly Court, Soho. 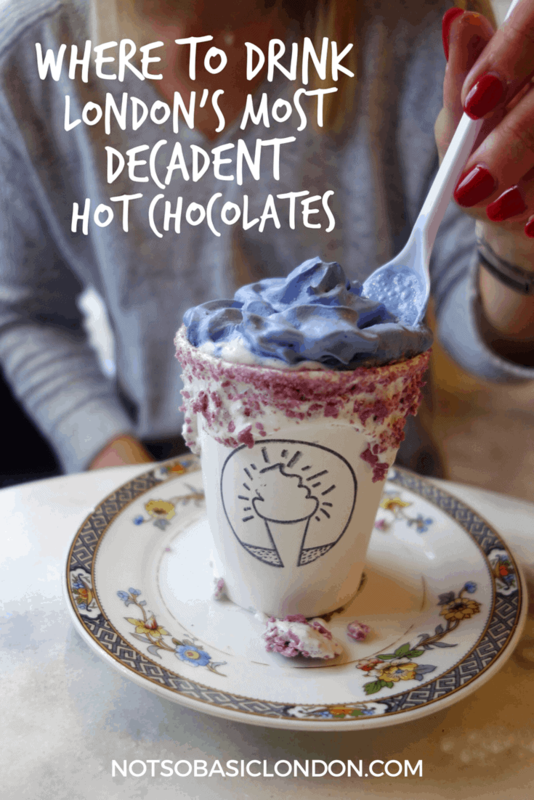 Their brunch menu consists of Jerusalem breakfast plates and a chocolate babka I really need to try (have you seen the pictures!) and their dinner is made up of small sharing plates including this aubergine shawarma. 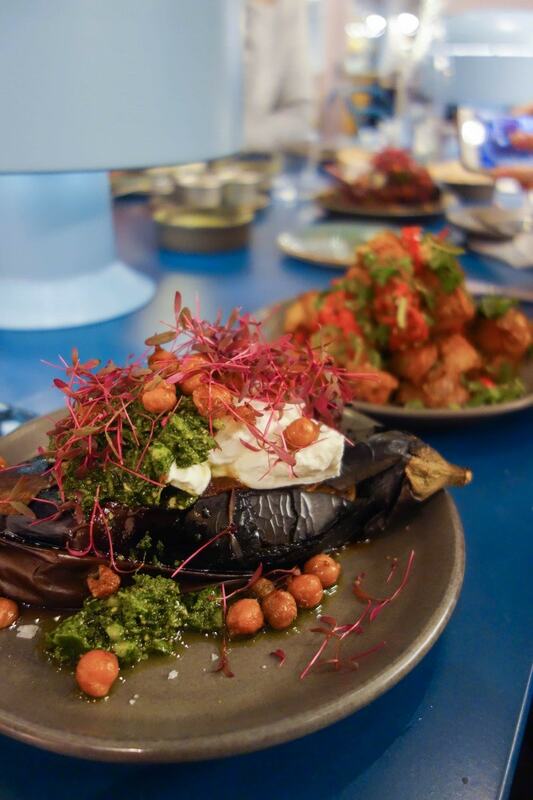 Baked and filled with crispy chickpeas, yoghurt and za’atar, it will have the meat lovers going veggie for the night. Trust me.It’s so good. 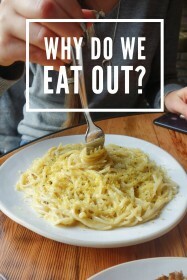 Next Post Should Restaurants Start Acting like Airlines?